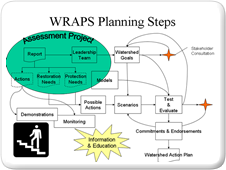 The goal of a WRAPS Planning Project is to prepare a document that identifies actions necessary to achieve stakeholder-established watershed goals. Stakeholder education and involvement are important components of every WRAPS project, especially Planning Projects which involve decision-making about watershed restoration and protection measures. Hosting informational meetings/workshops and developing printed materials (brochures) are two ways of educating stakeholders during a Planning project. Regardless of the methods, it is important that stakeholders are actively engaged in the process of developing the watershed Action Plan. Goals are general statements about what the WRAPS is meant to achieve. Watershed goals are often based on achieving “ideal” conditions (outlined in Assessment Criteria) to ensure that watersheds continue to provide the various functions and products that stakeholders value, such as a high level of water quality, safe drinking water supplies, and high quality habitat for wildlife. Watershed goals typically address the need for restoration and opportunities for protection of water and other natural resources. Restoration goals typically identify existing impairments or degradation such as TMDLs. Protection goals identify emerging problems or other issues that need to be addressed to prevent future impairments. Other goals might address the need for education; the need to protect drinking water supplies (sourcewater protection), and the need to restore/protect aquatic and wildlife habitat. Goals should address the need to improve (or otherwise change) and/or maintain current watershed conditions identified during the Assessment phase. 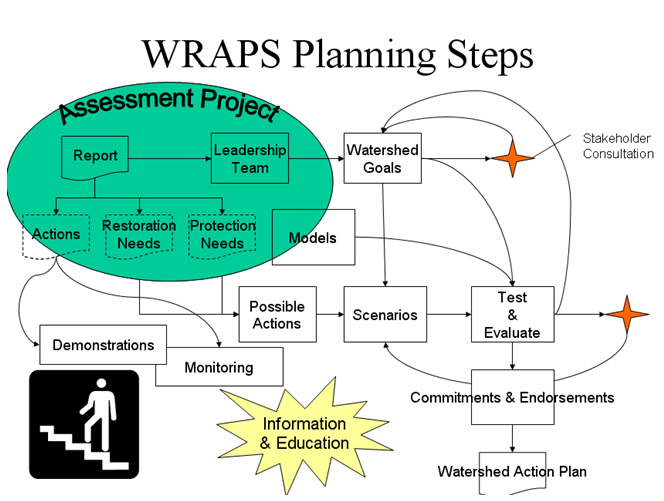 An important component of a Planning Project involves identifying actions to achieve watershed goals. These actions generally fall into four broad categories: structural practices (BMPs), information and education, funding, technical assistance, and regulatory approaches. Watershed restoration and protection actions often take the form of Best Management Practices (BMPs) or other structural practices intended to reduce pollution. A variety of well-defined practices and other actions have been researched and developed for a wide array of activities and audiences, including agricultural producers, urban and rural homeowners, local government operations, businesses and industries, and others. BMPs are also available to address a host of issues/concerns, including riparian area management, livestock and grazing management, commercial and industrial pollution prevention, public education and outreach, and others. Although some actions are targeted at restoration or protection, they often overlap and can be used to achieve multiple goals and reach multiple audiences. Information and education activities often include outreach campaigns targeted toward specific audiences and practices such as promoting proper use of pesticides and fertilizers to urban home owners. Other education and information activities include water festivals targeting elementary school children, watershed displays at county fairs and community festivals, and information about water conservation practices inserted into water utility bills. Other education actions involve demonstration projects of structural BMPs for agricultural producers. Watershed tours highlighting successful implementation of restoration practices, wildlife habitat areas, and surface water resources are another form of information and education. Funding actions typically take the form of cost-share funds and in-kind contributions of technical assistance to help landowners, homeowners, agricultural producers, and others construct structural improvements. Funding is also used to support information and education activities. Technical assistance involves the time and expertise of staff from government agencies, organizations, and consulting firms that is utilized to help develop and implement a broad array of other actions, including structural BMPs and information/education programs. Regulatory action is another option in helping to achieve watershed goals. This could include local codes and ordinances such as a wellhead protection ordinance, an erosion and sediment control ordinance for construction and development activities, and a county environmental/sanitary code. Other types of regulatory actions include land use management policies, such as planning, zoning, subdivision, and stream setback ordinances. A “watershed management scenario” is simply a combination of BMPs or other actions intended to achieve watershed restoration and protection goals. Computer models can be utilized to help identify the most effective scenario that will achieve watershed goals, especially goals related to pollutant load reductions. Economic analysis is also an important aspect of testing management scenarios to ensure that actions/measures are economically feasible. Based on the outcome of modeling and economic analysis, a specific scenario can be selected to achieve watershed goals. Ideally, the scenario will include a host of actions that are both technically effective at improving watershed conditions (restoration) and/or protecting resources, and cost effective. An action plan will only prove successful if watershed stakeholders, agencies, and others that have a role in implementing, funding, or assisting with the plan in some other way, offer an endorsement and commitment to supporting the plan. Endorsement and commitment can be informal or formal, and may take the form of a proclamation, resolution, or other public statement. Regardless of what form the commitment/endorsement takes, it is critical for the long-term success of a WRAPS that stakeholders “buy in” and support its goals and restoration/protection actions.